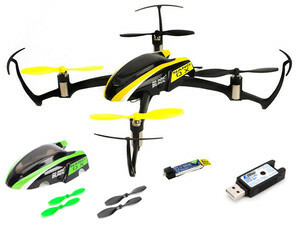 Here you have an E-Flite BLH7680 Blade Nano QX BIND & FLY Ultra Micro Electric Quad Copter !! This package will include the Heli, 3.7 Volt 150Mah Li-po Battery Pack, Charger And Owners Manual. Please understand that this sale includes the complete ARF E-Flite Quad-Copter Heli, Original Battery Pack, Charger, Owners Manual And Original Protective Storage Box. This way you can bind this new heli to any one of the New Version Spektrum Series Transmitters, charge & install on-board battery pack and you are up and flying !!! !